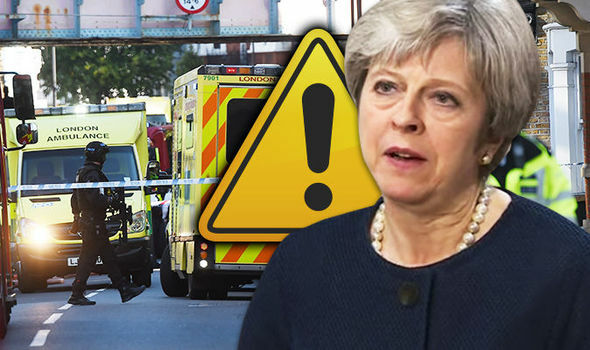 THERESA May warned another attack could be "imminent" and raised Britain's terror threat level to critical as police continue a major manhunt after today's Parsons Green tube explosion. This is the fourth time that the assessment has been placed at the highest level in the past 11 years. Mrs May also said military personnel will replace police officers on guard duties, and warned the public would see a greater presence of armed police on the streets. Theresa May said: “The joint terrorism and analysis centre, the independent organisation responsible for setting the threat level on the basis of available intelligence has now decided to raise it from severe to critical. “This means that a further attack may be imminent. Following JTAC decision, the police have asked for authorisation from the Secretary of Defence to enact part of the first phase of Operation Tempera.